Darwin Dietitians | 4 In 5 With Coeliac Disease Are Undiagnosed– Are You One Of Them? Nearly 200,000 Aussies are affected by coeliac disease. Alarmingly, it is estimated that 4 out of 5 don’t yet realise they have the condition. In fact, coeliac disease is one of Australia’s most commonly under-diagnosed conditions. If you’re feeling constantly low in energy, generally unwell, or frequently nursing digestive and bowel problems, you’re strongly encouraged to visit your GP and get tested for coeliac disease. Especially if you notice these symptoms are more severe after eating certain types of meals or foods. Coeliac disease is an immune disease (much like rheumatoid arthritis) brought on by eating gluten, a form of protein found in barley, oats, wheat and rye. The gluten reacts with the small bowel (intestines), causing inflammation and bowel damage. Left untreated, coeliac disease can lead to nutrient deficiencies, infertility, depression, liver disease, and some forms of cancer. 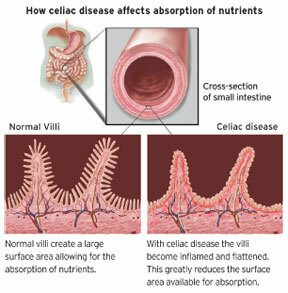 In those with coeliac disease, the intestinal villi are damaged by gluten, causing the symptoms. The only known method for treating coeliac disease is to strictly follow a gluten-free diet, which Darwin Dietitians can assist you with. 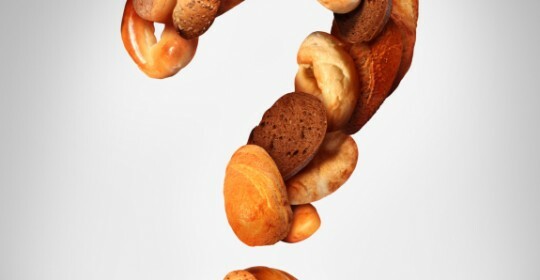 We will identify which foods in your diet contain gluten (you’d be very surprised where it turns up! ), and help you create a healthy gluten-free diet with maximum variety and minimal restrictions – ensuring you don’t miss out on your favourite foods. If you’d like to learn more or book an appointment, simply contact us here.